Teruko Wilde’s landscapes speak of a yearning for connection to the earth. Other artists may create a window on the world that invites the viewer into a measured space, but Wilde allows the scene to become a part of her being. Responding with emotion, she takes in the vast country of northern New Mexico and expresses its primal grandeur with color, physical sweep, and abstracting forms. Between the infinite horizon and the finite human presence lies the heart. Any visitor to Taos enters into a land with its immense scale and expanse that exceeds ordinary perception. Seeming but a split in the surface, the Rio Grande Gorge is a geological rift in the continent, in which one side pulls away from the other. Defying intimacy, this sublime land makes an individual sense the curve of the planet, reminding us of just how insignificant we really are. Yet our capacity for creation is equal in its magnitude. Diminutive in size, Wilde has the imaginative intensity to engage with this awesome place, in which she finds a freedom that she seeks in her life. Born in Nagoya, Japan, Wilde came to Lebanon, Ohio, as a teenager with her mother and American GI stepfather. She would marry a chaplain’s assistant that she met while living in Germany with her family. Although she seriously studied art, Wilde only realized that she could devote herself to this passion on her 40th birthday. In 1986 steeled by her daughter’s support, she divorced her husband and headed west to follow her dream. Through her life journey, Wilde developed an acute sense of place, heightened by an artist’s discernment and receptivity. Rather than alienation, her nomadic experience of geographical extremes sharpened her adaptability, so that this extraordinary landscape felt like home. As a painter, Wilde brings a stunningly unique interpretation based on repeated viewings over time. Finding an environment equivalent to her sensibility, Wilde captures the emotional effect of this big country directly. Traditionally landscapes are divided into three articulated areas receding into the distance. Wilde dissolves this stage-like arrangement into areas of color. 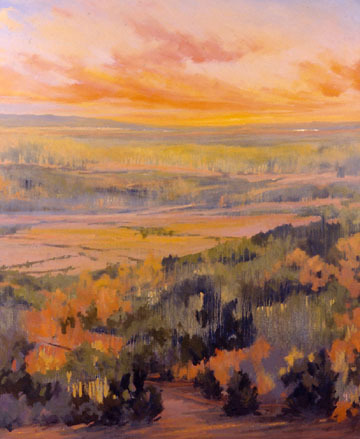 Befitting this high-desert area, her compositions are often a blend of plain and sky; but even when the canvas is filled with forest, the artist includes the sky in her color choices. While suggestive of the forms themselves, the colors seem to embody the light of the enveloping atmosphere. There is less of a sense of entering and more a quality of comingling or interpenetrating. Wilde likes to work fast, first getting down the primary relationships. Shunning detail, she intuitively builds sequential patterns from tree to forest to mountain, giving her compositions an organic flow. 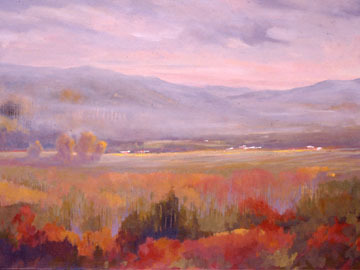 Significantly, Wilde’s use of oil paint embraces its material substance and viscosity, which she describes as having “more body.” Instead of forcing the paint into rigidly defined shapes, she allows the oils to follow the same rules as the rest of the physical world, so that her landscapes embody rather than render nature. Thinking quick, Wilde incorporates what she calls “intentional accident” into her process. This seeming oxymoron encapsulates the pairing of her intensity and expertise with her desire to break free of rote representation. Sure of herself yet able to roll with the punches, Wilde understands her materials so well that she can direct her movements while allowing for the unexpected and spontaneous. Nowhere is this more evident than in the drips that enliven Wilde’s landscapes. Wonderfully intricate tracings result when turpentine is allowed to run over the thick surface of oil paint. Quite simply, these evocative irregular lines are tree trunks, with entire forests emerging from the sensuous thinning of paint. While Wilde’s drips have been compared to those of Jackson Pollock, her practice is akin to Leonardo’s delight in discovering recognizable objects in stains on a wall. Allowing the viewer to project onto the scene, Wilde’s skilled orchestration of oil and solvent result in random yet willful marks reminiscent of the effects of nature itself. Over the past few years, Wilde’s landscapes have become more abstract, while always holding onto their initial visual inspiration. Working in her studio, she allows for memory to enhance the emotional content of her canvases, and she will leave off painting to return with fresh eyes. While Wilde’s landscapes are characterized by varying degrees of abstraction, they all have an insistent surface in which the illusion seems to float. It’s as if the world isn’t really separate from our experience of it. Wilde lives in a hybrid Earthship house at a vantage point on the fringes of Taos. In the fluid design of this structure where she has her studio, she can re-view the panorama over the year with a built-in feeling of being a part of the landscape. With a vocabulary of fixed, natural elements, she composes her paintings like sumptuous tone poems with exuberant variations on a theme. The very simplicity of her vocabulary allows for greater complexity, in the same way as the components of a sonnet or a haiku. With the very development of landscape genre, artists in the seventeenth century, such as Poussin, painted scenes as allegories of the seasons. Wilde reinterprets this tradition by drawing out the feeling and sensation, so that spring, summer, autumn or winter correspond to a mood as reflected in the exterior world. 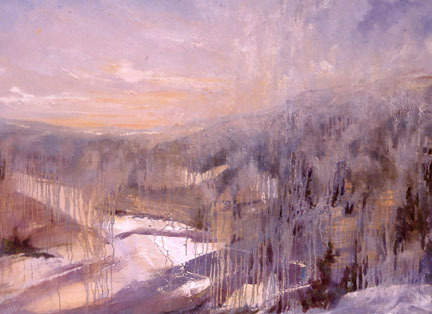 Her landscapes consist of bold juxtapositions of color that express elementary forces — heat and cold, fire and snow. The source of her distinctive palette is nature, but Wilde releases color from description in dazzling combinations. Some color choices almost feel like pigments taken from the surrounding countryside. Yet her preference for warm contrasts lends a hypnotic glow rather than a grounding, earthenware feel. Rather than a uniform screen or grid, Wilde’s canvases are jostles of color, in which vivid pigments are scarcely contained. Swaths of reds, violets, and yellows read as pure emotion. Easily excited, the artist’s sensibility quickly runs from high to low and back again — quick to laugh and to get agitated. Punctuating her conversation with well-placed “oohs,” she wants to “give the joy” to those who respond to her work. Even in the chill of winter, Wilde includes warmth, because “that’s how I feel.” For the artist, people are “what make things warm,” and she often includes a house to imply a human presence. Even though landscape orientation is typically horizontal, Wilde often chooses a vertical canvas, which tends to register as the equivalent of the human body. Unlike landscapes in which everything is mapped out, her paintings convey the feeling of physically occupying a space with a sensation of all that surrounds — the entire vista. Manifesting as spectacular displays, the seasons connect us to the cosmic order of the orbit of the Earth around the sun. Rather than intellectually understanding, we feel this positioning in the rhythms of light and growth. Especially in the Taos environs, the very scale and the broad horizon encourage an individual to feel a part of something much larger than themselves. Pushing at the boundary of the painted surface, Wilde’s landscapes remind us that the world is not “out there” but resides within us.